My Easy Marinara Sauce is finally out of the bag! 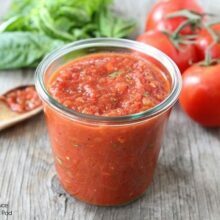 Learn how to make a homemade marinara sauce that goes with tons of meals, freezes easily, and tastes divine! Josh went to look the recipe up on Two Peas and Their Pod and couldn’t find it. I guess I’ve never posted my Easy Marinara recipe. Oops! I am so sorry I have been keeping my favorite marinara sauce a secret. I didn’t mean to! So, today the secret that wasn’t supposed to be a secret is out, I am sharing my recipe for Easy Marinara Sauce. Get out your aprons and let’s get to work. It’s going to get saucy in here! 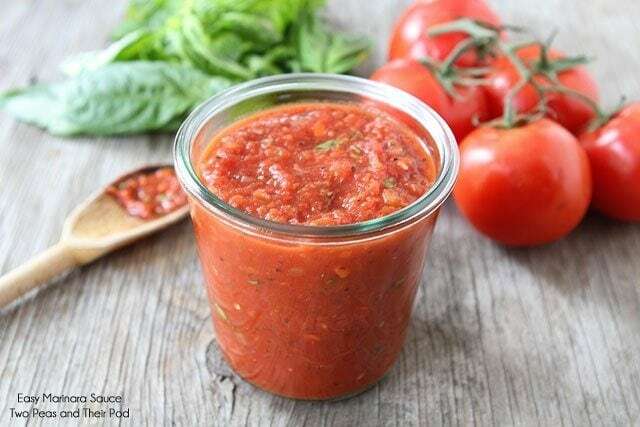 This homemade marinara sauce is made up of basic ingredients: olive oil, onion, garlic, carrot, celery, tomatoes, crushed red pepper, and basil. I use canned tomatoes because I always have them in my pantry. This is a great recipe to make any time of the year. My favorite tomatoes are San Marzano tomatoes. My special touch includes a pinch of fennel seed. I learned this trick from my dad. Make sure you just add a pinch because a little fennel goes a long way. I also add a bay leaf for flavor. Let the bay leaf simmer in the sauce and remove it before serving. Add a little sugar to cut the acidity in the tomatoes. This is optional. 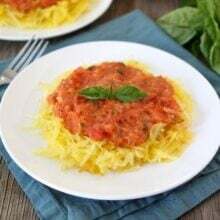 If I am using San Marzano tomatoes, I don’t add the sugar because they are lower in acidity, but if I am using regular tomatoes, I usually add a little sugar to cut the acidity. Use fresh basil. Fresh basil adds a ton of flavor to the marinara sauce. Let the sauce simmer on the stove for about 30 minutes so all of the flavors can meld together. This sauce freezes well and I am sure it can be canned, but I am not a canner:) To freeze, let the sauce cool completely and put it in a freezer bag or container and freeze for up to 2 months. Label the sauce and date it so you know what it is in your freezer. Defrost and use! 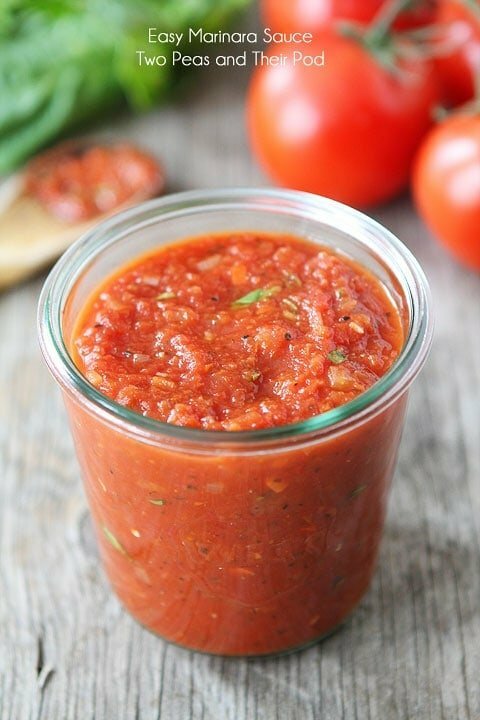 It’s the BEST marinara sauce and it is so easy to make! A win-win! So there you have it, my Easy Marinara Sauce recipe is no longer a secret. I hope you enjoy it as much as we do! This is my favorite marinara sauce. We make it all of the time! It goes great with pasta, lasagna, polenta, and any other Italian dish you can think of! In a large pot, heat the olive oil over a medium-high heat. Add the onions and garlic and saute until the onions are translucent, about 5-7 minutes. Add the carrots and celery. Saute until the vegetables are soft, about 10 minutes. Add in the fennel seed, crushed red pepper, and bay leaf. Stir in the tomatoes. Add the sugar, salt and pepper, and basil. Simmer uncovered for about 30 minutes. Remove and discard the bay leaf. Taste the sauce and season with more salt and pepper, if necessary. Note-I like to make big batches of this sauce and freeze it. You can also can this sauce. Serve with pasta, lasagna, polenta, chicken or eggplant parmesan, etc. I love Marinara Sauce. The easier the better. I would have to freeze the extra right away though. The more available the more I add to my pasta. I do not like to use canned tomatoes. Do you think using fresh would have the same results? Would you change anything if using fresh tomatoes? I love the fennel seed addition. I definitely will be trying this one. I love that this uses canned tomatoes! So easy! Glad your secret is out! 😉 Can’t wait to make it! I can’t wait to share this with my readers. You’ve made a common classic look so beautiful! Fabulous recipe. Thanks for this! I’m always looking for a good marinara recipe so I don’t have to buy the gross bottled kind from the store. Looks delicious! Thanks for sharing this…we are having it tonight! Yum! This looks full of flavor! simple, fresh and beautiful, and something my family uses every week. Great recipe! Love this! A must know how! Just give me a funnel. 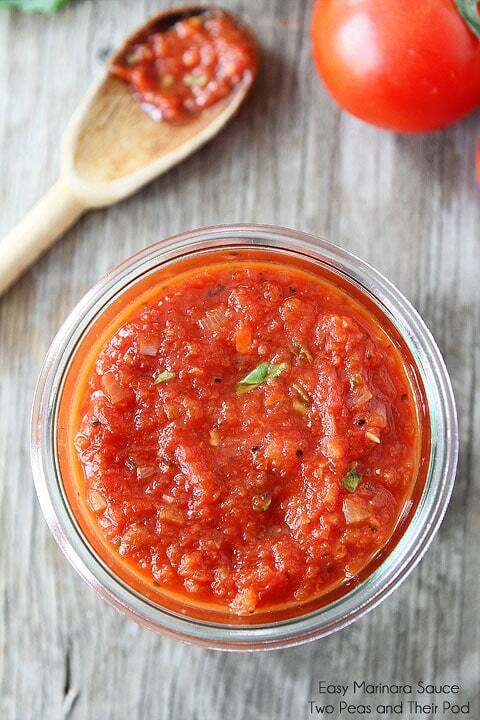 This marinara sauce can be used on everything!!! Oh yeah, I love homemade marinara sauce! This sauce looks so healthy and delicious! I will have to make lots of it and freeze it for future recipes! 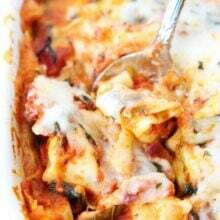 Looking forward to your baked pasta recipe! I just LOVE baked pasta! I am pinning this to my MomHomeGuide Pinterest recipe board! Looks SO delicious, Maria! I bet it would be as tasty on pasta as it would be mixed into mussels. Great recipe, gotta try it! This sauce looks fresh and delicious. There are a million great ways to use it too! 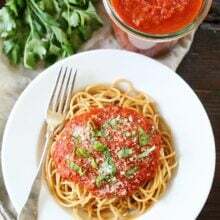 Homemade marinara is a staple in my kitchen and it is so easy to make ! I like the use of the fennel seeds in this one! Always good to have an easy marinara sauce recipe on hand! Thank you! Absolutely love a good and delish homemade marinara sauce! This looks so fresh and flavorful – love it! This looks delicious – I can’t wait to give it a try! I love homemade marinara! So much better than the store versions and so easy to make! Love this! It looks so fresh and tasty! I don’t let anyone mess with my tomato sauce either so I totally understand! our sauces are actually SUPER similar! This looks so delicious and your pictures are beautiful! Looks beautiful, I always have a jar of homemade marinara sauce on hand! All cooks should have a great, basic marinara sauce recipe. And this one is really fantastic! It’s very similar to the one I use. Love that little pinch of fennel seed in there! This sounds like a great way to use my put up crushed tomatoes. I’m glad to know it freezes well–thanks! I love simple sauces. This looks great, Maria! Perfect timing! I’m making homemade mozzarella sticks and I needed a good marinara dipping sauce. Thank you! Fresh and bright and delicious – looks fabulous, Maria! Everyone needs a quick sauce recipe! This looks great. I like that there isn’t a too much sugar, I’m not a fan of sweet marinara sauce! This looks so fragrant and gorgeous. Thanks for posting it. I don’t know how many more nights I can stand the jarred crud from the store. WOW…gorgeous photos! Seriously! So bright, vibrant and delicious. This one goes right to my Pinterest board! I take the photos for our site and am still learning a lot on this front. I am always so impressed with your images. This is a great basic recipe one can make a bunch of and freeze…then take one out and add lots of other goodies to…mushrooms, spinach, ground meat, etc. Thanks for sharing! Definitely loving the simplicity of this! Love the idea of fennel in there, never tried that before. Thank you for sharing your secret!! I was just talking to a coworker tonight and saying I wanted to add making my own sauce to my list of accomplishments this season….now I can get started before tomatoes are even in season completely. Which is great, since that seems to be just before the first frost up here in Maine. Thanks for posting. I had an easy recipe but I misplaced it. Looking forward to giving your recipe a try. I’ve been waiting for a recipe like this for a long time! Thank you! Now I’m starving, pasta and sauce is one of my favorites! I can almost smell the yumminess. Made tonight. So good. Tastes so similar to my fresh summer roasted garden tomato sauce recipe. Won’t be buying the bottle stuff anymore when we run out of the garden fresh. Thanks! Glad you liked the sauce! Do you know what the nutritional values of this sauce is? I just finished making this. Delish!! It was super easy. Thanks for sharing. I made this and it is fabulous. Also reheated it from the freezer and yes, it absolutely does freeze well. I am going to try it it fresh tomatoes when they are in season. Love this sauce! It was easy to make and tasted great. I thought it was even better the next day. I used 2 carrots & 2 celery stalks though. This would go great with tilapia fish sticks! What brand of diced tomatoes do you use? When do you add the oregano? Hey Maria. 2-28oz cans of tomatoes is 7 cups total, if my math is correct, so could i substitute 7 cups of my canned tomatoes in place of the store bought cans? Have made this and love it! Would like to can some this summer while doing tomatoes anyhow! Any idea on canning times? I get nervous about winging those! Has anyone tried this recipe in a slow cooker? I’m a little confused…it says “diced crushed tomatoes”. Which is it, diced or crushed? Those are two different products! Sorry about that! I use crushed tomatoes. I updated the recipe. Both will work, it just depends on how chunky you like your sauce! How is it that your sauce looks so fresh? I’ve made this recipe several times and it never looks as vibrantly red as your photos. Also, did you add the basil in after cooking just for the photos? Please to assist! Thank you! Maybe the brand of tomatoes makes a difference? Ours is always that red though. I stir in the basil as stated in the recipe. 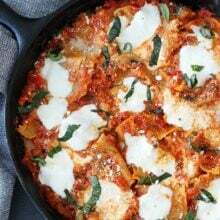 LOVE this recipe & it’s my fav marinara. However, it’s super runny- even after blending with my immersion blender. Sauces are my weak spot. This sounds delicious! Pinned it!! I was wondering what brand of tomatoes you use? If I choose to leave out the sugar will it still taste good? Yes, the sugar just cuts the acidity in the tomatoes. It will be fine without! I made this tonight and it was delicious. I only had roasted diced tomatoes so used those. We had it over red lentil pasta. I plan on freezing leftovers. Next time, we’ll make a bigger batch. Thanks. Yay! Glad you enjoyed the sauce! Fresh would work! I am not sure how many though! but I have one question how much mean 2-28 oz. cans crushed tomatoes by account? You need 2 cans of crushed tomatoes, 28 oz size. Is there a button I missed for a printable version of this? Looks delish and I have some fresh tomatoes to use up. In the recipe box, there is a print button. Enjoy! 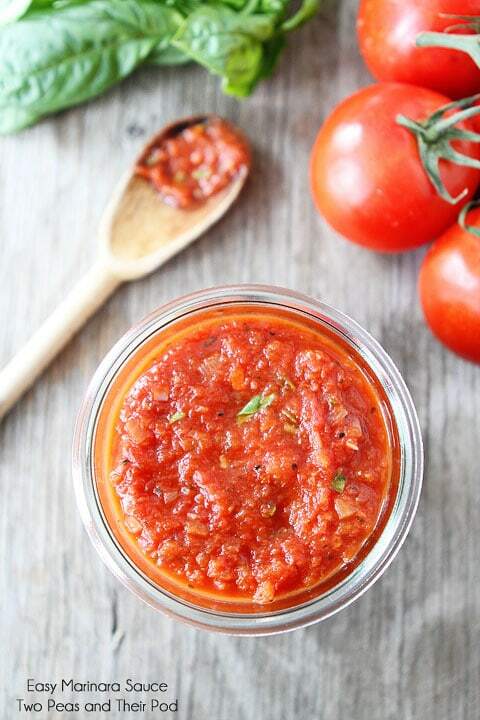 Do you use a certain brand of crushed tomatoes? Feel like that makes a big difference 🙂 Thanks! I may never buy spaghetti sauce again! This was so good. Thank you for sharing. So happy you liked the sauce! What step should the oregano be added? I made this, and didn’t even have the veggies to go in it…however, I did add celery seed and fennel as suggested and sugar as I usually add sugar to my sauce. This was delicious! It was amazingly delicious for how simple it was. Thanks so much for my new quick go to!